The Wells Fargo Propel card is one of the best no-fee travel cards on the market, thanks to its 3x point bonus. A big perk of the Wells Fargo Propel card is its generous sign-up bonus – 30,000 points if you spend $3,000 in the first three months. While this is not the largest introductory offer you’ll find among travel cards, it is top-notch for a card with no annual fee. That being said, cardholders eager for an initial influx of points to spend on travel might be better suited applying for a card that comes with an annual fee and a higher bonus. The Capital One® Venture® Rewards Credit Card, for example, offers 50,000 miles to users who spend $3,000 in the first three months and waives its annual fee for the first year. The Wells Fargo Propel card has a lucrative rewards rate, including 3 points per dollar on dining, travel and transit, gas station purchases and select streaming services. Cardholders earn 1 point per dollar on other purchases. With bonus categories including purchases such as dining and gas – which make up a significant part of many users’ budget – it is easy to rack up a substantial number of points. Best of all, there is no spend cap on the 3 point-per-dollar bonus categories. That means heavier spenders don’t have to worry about meeting a cap and earning sub-par rewards. We estimate this amounts to a 1.78 percent earning rate for a cardholder who spends an average amount in the bonus categories. This is an exceptionally high earning rate for a no-annual-fee card, putting the Wells Fargo Propel card on par with some premium travel cards. Tip: With its high earning rate, the Wells Fargo Propel card often beats the earnings on premium travel rewards cards with higher earning rates once you subtract those cards’ annual fees. Be sure to do the math to see whether the Propel card or a premium card is the better value for you. What are Wells Fargo Propel card points worth? For the most part, Wells Fargo Propel points have a 1 cent-per-point value, whether you redeem them for a travel purchase or cash back. However, there is one exception. Wells Fargo allows Propel cardholders to easily transfer their points between other credit card accounts with the bank. That means users can transfer Propel points to the Wells Fargo Visa Signature® Card – which ekes 1.5 cents per point when redeemed for airfare. If you use your Propel card points to book travel through Go Far Rewards, you can often get great value out of them. Wells Fargo’s travel portal includes vacation packages and special deals on other travel purchases that let cardholders stretch their rewards a bit further. Just be sure to compare prices on Go Far Rewards to other travel sites to ensure you are getting the best deal. You can always redeem for a statement credit or cash back if you find a cheaper flight or hotel on another site. Tip: Since Propel card points offer the same value whether you redeem them for cash back, statement credits or for travel through the Go Far rewards site, you should compare all your options before you redeem them through the Go Far Rewards site. Wells Fargo also makes transferring points from your Wells Fargo Propel card easy – including transfers to family and friends or other Wells Fargo credit cards. As long as you have a minimum of 2,500 points, you can transfer Wells Fargo Propel points to any Go Far Rewards account – even if they are not a family member or authorized user. You can even transfer points to a Wells Fargo checking or savings account at 1 cent per point. Propel cardholders can additionally set up a pool for friends to add points to, in order to combine rewards for a bigger redemption. When you have more than one Wells Fargo Go Far Rewards credit card, you can also combine all of your points. This proves particularly lucrative for Wells Fargo Visa Signature cardholders, who can boost point value. Tip: A key feature lacking from Wells Fargo points is the ability to transfer points to airline and hotel rewards programs. Several programs, including Capital One, Chase Ultimate Rewards and American Express Membership Rewards allow you to transfer points to outside programs, and it’s great way to glean extra value out of your points. If you’re interested in becoming a points hacker, you should check these programs out. For travel enthusiasts, you can get more value out of the Wells Fargo Propel when you pair it with the Wells Fargo Visa Signature card. The Visa Signature doesn’t have a very high rewards rate on its own, but it comes with a 50 percent bonus on airfare point redemptions. If you spend at least $50,000 on purchases per year, that bonus jumps to 75 percent. When you take advantage of this pairing, the Wells Fargo Propel card can become more valuable than many cards with an annual fee – even in the first year. Though annual fee cards have higher sign-up bonuses and rewards rates, transferring points from the Propel to the Wells Fargo Visa Signature can make up for this difference. For example, if you take the same $15,900 annual spend mentioned above for both the Wells Fargo Propel (paired with the Visa Signature) and the Capital One Venture card, you can actually earn more in the first year with the Propel. Is the Propel card an American Express card? The Wells Fargo Propel card is an American Express card – rather than a Visa or Mastercard. However, it is important to note that the issuer is Wells Fargo, not American Express. This is important, as the card earns Go Far Rewards points rather than Membership Rewards. You can only redeem points earned on the Propel card through Wells Fargo’s portal. Unlike a card issued by American Express, you cannot redeem Propel points through Amex travel or any other Membership Rewards redemption option. One exception to this separation is American Express Connect, which allows third-party Amex cardholders to take advantage of some Amex Offers. Deals include cash back on travel, dining and retail purchases just for adding an eligible offer to your card and using it to make a qualifying purchase. American Express cards are not accepted at quite as many merchants as Visa or Mastercard, but their acceptance is fairly wide in the U.S. Holding an American Express card becomes more difficult when you travel abroad, as fewer merchants are able to take Amex in foreign countries. 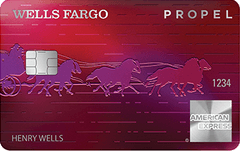 Unlike many American Express cards offered by Amex, the Wells Fargo Propel card is a true credit card – not a charge card. This means you have an APR and are able to carry a balance month-to-month. Access to presale and VIP event tickets – As an American Express card, the Wells Fargo Propel qualifies for Amex presale tickets where available. No foreign transaction fee – Though it may not be as widely accepted abroad as a Visa or Mastercard, the Propel will not charge you a foreign transaction fee. Car rental loss and damage insurance – As long as you charge the entire cost of your rental car to your Propel card, you’ll receive excess coverage (cost not covered by other plans) up to $50,000 per rental. Lost luggage insurance – If your luggage is lost or damaged by the carrier, you can be reimbursed up to $1,000 per trip. Travel accident insurance – This perk provides up to $150,000 of coverage in the case of accidental death or dismemberment while traveling by plane, train, ship or bus. Retail protection – If a qualifying purchase made with your Propel card is damaged or stolen within 90 days, you can be reimbursed up to $1,000 per loss. Extended warranty – Your Propel card extends the store or merchant warranty (on warranties of one year or less) to twice the advertised amount. Return protection – If you try and return an eligible purchase within 90 days and the store won’t take it back, the Propel card can reimburse you up to $300 per item ($1,000 maximum per year). While most of the shopping protections on the Propel card are fairly standard, the card does include some nice extras for frequent travelers. Perks such as lost luggage and travel accident insurance can add up to significant savings if necessary. However, if you are hoping to use a credit card to fund your travels, you should note that the Propel card falls short on travel perks compared to some premium cards. For instance, it doesn’t include trip cancellation or primary rental car insurance – two potentially valuable benefits in case your trip goes awry. Wells Fargo’s customer service is decent but far from the best among major issuers. In J.D. Power’s 2018 customer satisfaction survey, Wells Fargo scored a 777, coming in ninth among 11 major banks. On the plus side, the bank does offer 24/7 customer service and an online chat feature for cardholders needing quick answers. The Wells Fargo app also rates well with users – rating 4.4 out of 5 in the Google Play Store and 4.8 out of 5 in the Apple App Store. How does the Propel card compare to other travel cards? While the Propel card is a top-notch, no annual fee travel card, it is not the only good option out there. Depending on your spend patterns and what you are looking for in a sign-up bonus, several other no-fee travel cards have competitive offers. The Capital One VentureOne card is one of our most popular no annual fee travel cards. Its general rewards rate can’t compete with the Propel, but cardholders who spend a significant amount on hotel purchases can boost their rewards earning with a 10 mile-per-dollar rate on stays booked and payed through hotels.com/venture. As an added bonus for frequent travelers, Capital One recently added 14 airline transfer partners – offering the ability to stretch miles a bit further. While we estimate the Propel’s average rewards rate at around 1.78 points per dollar, the Bank of America Travel Rewards card only earns 1.5 miles per dollar on all purchases. However, Bank of America customers with a significant balance in a checking or savings account (or a qualifying Merrill Edge or Merrill Lynch account) can boost their earning with the Preferred Rewards program. Depending on your tier, you could earn up to 2.62 points per dollar – which is outstanding for a card with no annual fee. A unique bonus offer sets the Discover it Miles card apart from other travel cards. Rather than a flat bonus, the card matches the miles you earn in the first year. That means heavy spenders can get unprecedented value out of the offer. For example, if you spend $2,650 per month on the card, you’ll earn nearly $500 from the introductory offer. This is competitive even with travel cards that include an annual fee. After the first year, however, the rewards rate on the Discover it Miles fails to impress. With just 1.5 miles per dollar on all purchases, it doesn’t match the rate on the Propel. Why get the Wells Fargo Propel card? You want a competitive rewards rate on a travel card with no annual fee. You prefer flexible redemption options that don’t sacrifice point value. You own or are planning to sign-up for the Wells Fargo Visa Signature card. You will take advantage of travel and purchase protections to save money. If you don’t currently have a Wells Fargo Visa Signature card, consider signing up for one. You can transfer points earned on the Propel to the Visa Signature to earn a higher point value on airfare redemptions. Use the card for all dining, travel, gas station and select streaming services to earn bonus points. Use the card for travel and cell phone purchases to qualify for protections. Compare travel costs on Go Far Rewards to other travel sites to ensure you get the best deal. You can redeem points for a statement credit to cover travel purchases on other sites. Keep an eye on eligible Amex Offers to earn cash back on everyday spending. Visit Wells Fargo’s Earn More Mall to earn additional points or cash back on your purchases. Is the Wells Fargo Propel card worth it? If you are looking for a top-notch travel card without the annual fee, the Wells Fargo Propel card is one of the best available options. You’ll earn a competitive rewards rate and receive many of the same travel protections that come with other travel cards. The card is even more valuable for Wells Fargo Visa Signature cardholders, who can boost their points earning with the Propel’s rate and transfer to the Visa Signature for a better point value (when redeemed for airfare).